So how come when I suggest this to someone it means I’m “maladjusted” but when Andrew Hoy does it it’s an internet sensation? Too muddy outside this winter for the kiddies to play? Not enough snow for sledding, and too wet to ride the bikes on the driveway? Andrew Hoy has a solution: stick that thing on a lunge line. Some knowledge of physics is certainly required so one doesn’t send one’s wee tot slinging down the barn aisle to careen off of stall doors or bash her right into the wall, but if you’ve got your circle circumference worked out, this is a great way to get a child good and properly dizzy. 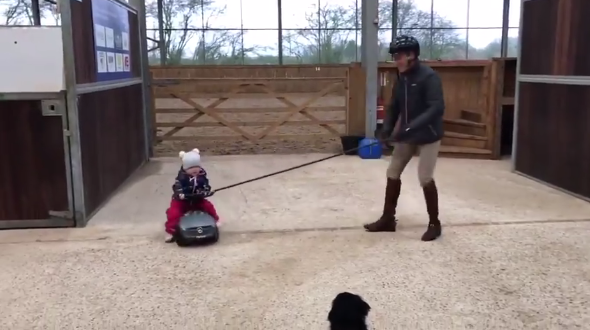 #EquestrianLifestyle | PegaseBuzzEvery parents should lunge their kids.Video: Andrew Hoy Eventing.